Newly available in 2008, this exceptional luxury 2nd floor apartment is part of La Dama De Noche complex . It is only 10 minutes walk to El Corte Ingles department store and less than 15 minutes walk to the famous Puerto Banus Marina and its beaches. The apartment is furnished to the highest standard and is set in beautiful landscaped gardens with a large west facing terrace for afternoon and evening sun. The community is gated with 24hr security and has two swimming pools, paddle tennis courts and a children�s area. The nearest late night shop less than 5 - 10 minutes walk. 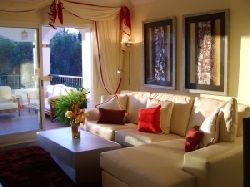 The apartment has a large covered west facing terrace with views of the mountains and Nueva Andalucia. Well positioned for golfers the Complex includes a 9 hole Golf Course, the first in Europe to open 24 hrs a day and the only floodlit Golf course on the Costa Del Sol for night playing. Other well known golf courses are within short driving distance eg. Alhoa Hills, La Quinta, Mirafores, Le Cala, Los Famingos. There are over 30 top class courses to choose from within short driving distance. Explore the history of Andalucia with visits to Marbella, Granada, Ronda, Seville and the nearby White Villages of Benahavis and Istan high in the mountains. There is also Gibraltar for duty-free shopping. * Subject to non-refundable deposit of 25% and full payment 3 months in advance (bookings of 7 days or more) ** Subject to availability and excluding June, July,August and September. Discount does not apply to weekend breaks.